When I meet a homeschool mom I like to ask one question - what is your biggest homeschooling struggle? Do you see it? Homeschool moms think their homeschool struggles exist because of their own lack of motivation and discipline. How did we get this way? When did we start seeing ourselves as slackers? Why do you think you are a slacker, homeschool mom? Let me tell you a little secret - it has nothing to do with your self-motivation or discipline. You are NOT a lazy homeschool mom. But, you probably have made a few mistakes and created an experience that makes it impossible to do things well. There are four mistakes we make that put us in this trap of thinking that we're unmotivated, undisciplined, and lazy. What happens when you cram so much into your day that you (and the kids) are feeling stressed and overwhelmed? Well, I tend to be a little all or nothing and when that feeling comes I head to nothing-mode and completely ignore everything I need to do. And then I beat myself up for being lazy. If you want to be a homeschool slacker, this is the first step for you - create a perfectly color-coded schedule that you have no hope of sticking to for the long haul. What if you don't want to be a homeschool slacker? There's actually a pretty easy fix - don’t set yourself up for failure. The wise homeschool mom knows she needs to cut back on her commitments and activities and remove some non-essentials from her homeschool day. Do you really need that second grammar program? I think you can toss it and the guilt that goes along with it. The homeschool slacker in training knows that they should cram their day full (see step #1) and then choose a curriculum that makes their kids cry. Guess what? You're not lazy and unmotivated. You simply chose a program that didn't fit your needs and now you're avoiding it because it isn't right for you. But it’s the PERFECT curriculum! So-and-so told me that it’s the best thing to use. It doesn’t matter if someone else considers it the best thing since sliced bread if it doesn’t work for your child it isn’t best for your homeschool. So, if you want to be a homeschool slacker make sure you choose only the highest recommended programs and forget to take your children into account. Guess what? It's another easy fix - consider what fits your kids and homeschool situation. The wise homeschool mom understands herself and her children and looks for curriculum and resources that work for her (and she covers her ears when someone tries to tell her about that shiny new curriculum). Chosen that perfect curriculum (completely ignoring what works for your child)? Yes! Now let’s really set ourselves up for failure by expecting too much from our kids. The homeschool slacker knows that it’s okay to make their four-year-old struggle through a 45-minute phonics lesson or their first grader do 20 pages of written work. So if you are determined to be a homeschool slacker make sure you ignore the ages of your children and expect more from them than they are physically able to achieve. Easy fix number three! Set some goals but make them attainable. Spend 15 minutes a day working on that phonics lesson. Whittle down those written assignments to just a handful for your first grader. 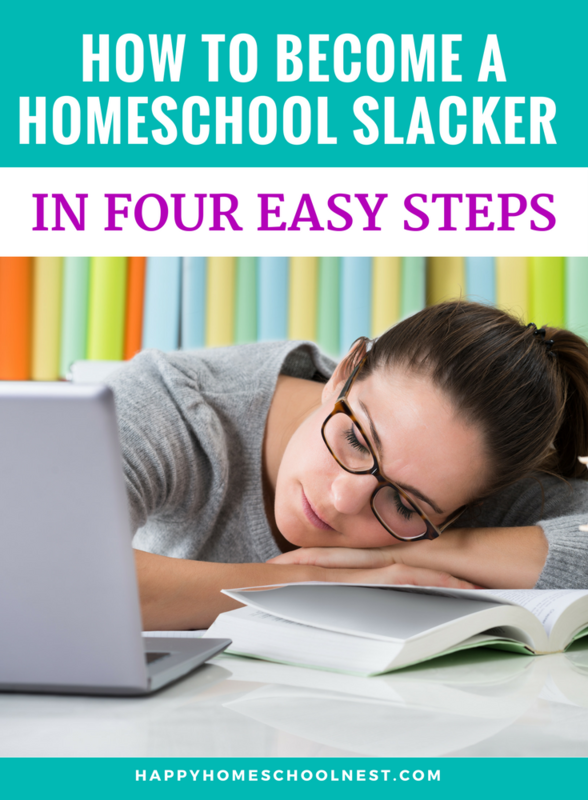 If you haven't completely burned yourself out trying to follow the previous three steps - well, step four will have you becoming a homeschool slacker in no time! The experienced homeschool slacker knows it’s not enough to cram their homeschool day full, continue the endless search for that perfect math program, or expect too much from their kids. On top of it all, they expect that they can keep their house perfectly clean and serve a home-cooked, three-course meal every evening. As if a busy homeschool day isn't enough, we believe that we can keep our house in perfect order. After all, we're home all day, right? Doesn't it make us lazy and undisciplined if we can't keep up with it all? If you believe that then you are probably on your way to becoming a homeschool slacker (because you are going to completely wear yourself out striving for perfection). Easy fix #4 - realize that your home is going to be messy and meals will often be something that can be made simply and quickly. The wise homeschool mom understands that she isn't perfect and she really can't do it all as perfectly as she would like. Sometimes good is good enough. Are you a homeschool slacker in training? Are you completely burned out just reading this list? I know I am. I know I exaggerated some of these issues, but I really wanted you to get the point. We think that a perfect schedule or curriculum (or perfectly behaved children) will make a difference in our lack of motivation and self-discipline. You don’t lack motivation or discipline. You’ve set yourself up for failure with the decisions you’ve made and the lies that you've believed. Ditch the color-coded schedule and create a daily routine that accounts for normal life, choose the curriculum that suits your family and the ages and learning stages of your children, set realistic goals for your homeschool, and create some simple systems to help you manage it all. Those four simple things will keep you from becoming a homeschool slacker. Homeschool mom, have you called yourself lazy and unmotivated? Was it true or did you set yourself up for feeling that way? Leave a comment below. I'd love to continue this conversation with you.